Honey & Butter: Summer Cravings ... 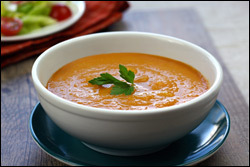 Lobster Bisque Low Cal & Low Fat! Summer Cravings ... Lobster Bisque Low Cal & Low Fat! Add 1/2 cup stock to a medium nonstick pot. Bring to medium heat. Once boiling, add halved lobster tail. Cover and cook for about 3 minutes, until shell halves have turned red and lobster is cooked through. Remove lobster tail halves. To the pot, add onion, carrots, celery, tomato paste, and garlic. Stir well. Add remaining 1 1/2 cups stock and bring to a boil. Reduce to a simmer, cover, and cook for about 20 minutes, until veggies are soft. Meanwhile, remove lobster meat from the shell and chop into small pieces. Discard shell. Remove pot from heat and stir in powdered creamer. Let slightly cool. Transfer to a blender and puree until smooth. Pour pureed mixture into the pot, and stir in lobster. Bring to desired temperature and enjoy! If you are a low carb dieter this would be 17.5 NET carbs per serving.